Here's what the University of Austin Texas had to say in it's description of this awesome forest floor plant. "A very aggressive fern of worldwide distribution for dry woodlands. The only fern for most dry shade situations. Ideal for dry Post Oak (Quercus stellata) forests and pine forests. The tripartite, furry, silvery fiddleheads emerge in early spring. The roots colonize aggressively and extend deep in search of moisture, as far as 10 feet deep in some locations." This plant above was very aggressive and vigorous in the San Jacinto mountains where I observed it. It's own personal nature as a component of the forest floor grid is obvious. Deep rooted for a fern as noted above and any possible mycorrhizal grid connection make it a worthwhile study for any forest rehabilitation project. Most projects only consist of tree plant with little attention to other complex factors. Let me provide an observational example. 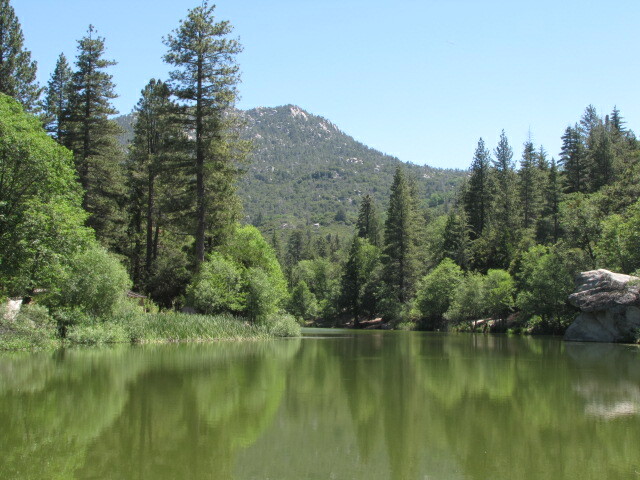 Along Hwy 243 in the San Jacinto Mountains halfway between the lower city of Banning CA and the high mountain town of Idyllwild CA, there is an area just west of Bay Tree spring and the James Preserve called Vista Grande. The area of Vista Grande has a Ranger Fire Station and a near by Girl Scouts Camp. The area between the Scout Camp and the Ranger Station is relatively flat, almost like a saddle on this particular part of the ridge top where the state highway travels across. Here is a portion of a map of what I am talking about. Vista Grande Fire Station on Hwy 243 with Lake Fulmer just a few miles past the station. Now the only reason I'm giving the above references is because I cannot find no photos out there of the surrounding landscape across the street and around the fire station. However if you can do a Google Earth Search of Vista Grande Fire Station & Hwy 243 CA, you can actually follow the Car mounted Camera drive and pan around at the view of the massive amounts of the above mentioned Western Bracken Fern which grows prolifically out in the open between sparsely forested areas across and around this Ranger Fire Station. Clearly the grid is deep and healthy in this area as there are no streams or springs at the top of this particular area. This is a very dry area prone to forest or brush fires every single year. Yet at this hot dry location (often 90+F) we find the Western Bracken Fern thriving out in the open, not under the cool shady canopy of a heavily wooded old growth forest scenario next to a stream. 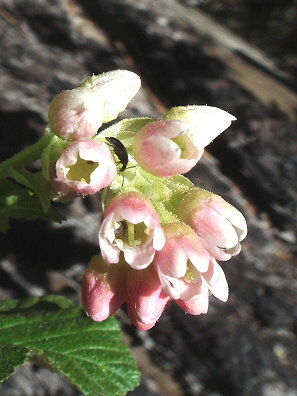 Native to 4000-8000' throughout California. When I lived in Idyllwild CA this plant flowered in April to July with 6" and looks like hanging pink fireworks brush strokes in the night sky. 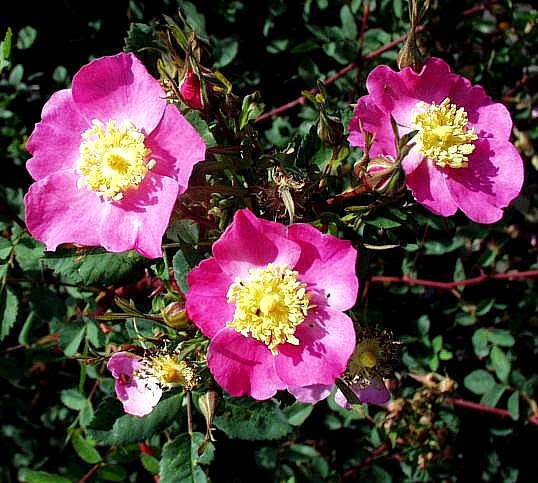 This is one of those plants that can grew along the creeks in shaded areas or sometimes just in moist woodland areas under the pines. It can survive drought well but most likely receives some moisture from the grid if available. Basically this plant does a nice job of spreading itself completely through a networked system of underground Rhizomes which sprout up even far away from the plant. Like all other plants it no doubt has connections through the underground grid of VAM mycorrhizal networks. This is yet another example of a keystone species, that is, a plant that cements a relationship between the other plants, the animals, birds and insects that inhabit the area, but also connecting through the grid and transporting all manner of water and nutrients to other plants along and within the mycorrhizal grid. And I'll stop here with this plant and explain more of my personal observations about the effectiveness of the grid or fungal network. I lived up in Idyllwild California before moving to Anza just to the south and west of this area. There were two more personal educational observations out in the natural world I witnessed in that high mountain town that have stuck with me ever since the early 1980s and helped me to understand the importance of "Earth's Internet"
There's a major stream that runs through the town of Idyllwild called Strawbeery Creek. One day while walking the creek I came across what I thought was the Western Dogwood (Cornus-nuttallii) I was interested in identifying as many San Jacinto Mountain natives as I could. I often went fishing early in the morning along that creek before going off to work down the mountain in either Hemet CA or Palm Springs CA. Finally I thought I had discovered it. But it wasn't till a couple years later I went back to look at it and discovered it wasn't a Dogwood at all. Here's what I saw. 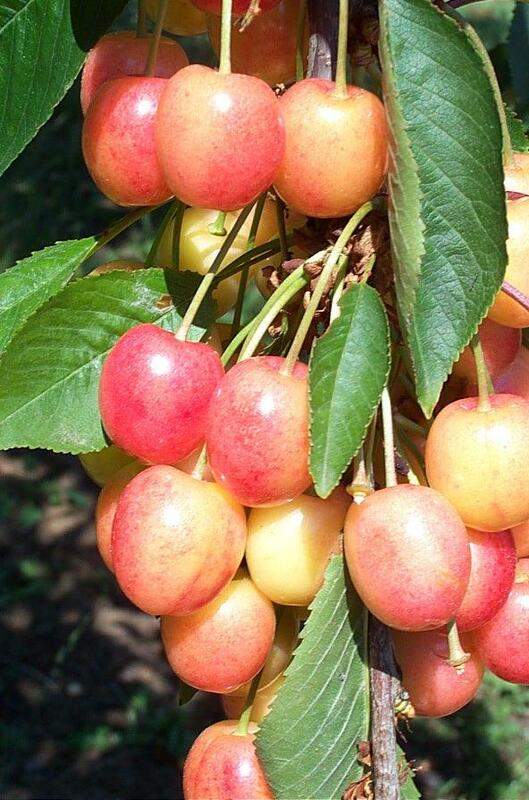 It was a CHEERY TREE and not just any cherry tree, but a Queen Anne Cherry tree. 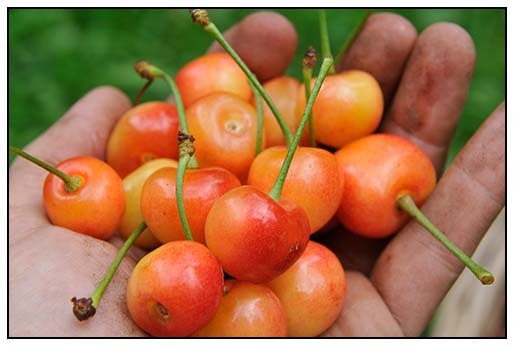 Unlike the deep purple Bing or Red Pie cherries, these were those deep orange yellow with the splashes of red on them. 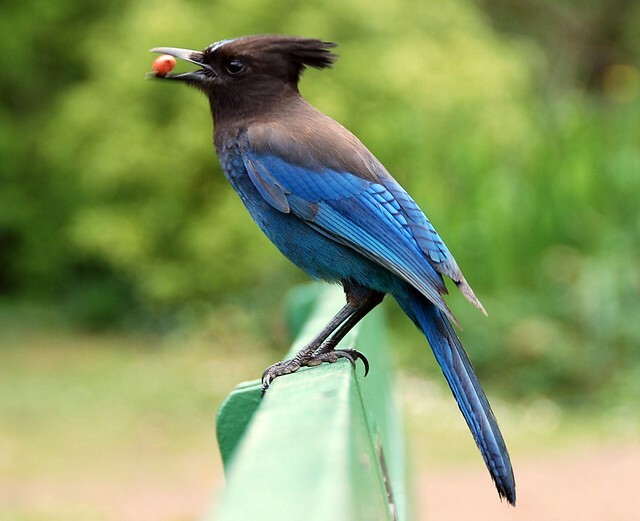 Incredibly I was also suddenly startled by a Stellar's Jay who popped out of the branches with one in his beak. Years have past and not only is that original tree still there, but many others have volunteered, no doubt courtesy of the Stellar's Jay's habitat of gathering as many as possible and burying them elsewhere. As far as the original tree, I can only assume that there was a hiker out for a stroll eating these cherries and spitting them out where on of the pits got lucky. Still, how could such an domestic Orchard type of a tree succeed like this ? On another odd note, being that it was an orchard tree and only seeing trees grow abundant fruit out in the open full sun as the AG Experts no doubt would insist, how could this tree be so successful in the dark of the forest ? The native trees along this creek are practically giant hundred years old trees, some a few hundred years old. Again how can they succeeded in virtual shade and produce so much ? Hmmmmmmm!! Another example and just a few hundred feet away up the creek along the road in someone's private property. The major intersecting roads are South Circle Drive and Village Center Drive. At the junction facing north you simply drive or walk on Village center Dr towards the shopping area. Cross Strawberry Creek and immediately on your right is a property with a rather large Standard Red Delicious Apple tree just off the road and property line. Now this tree is also in perpetual darkness of the old growth shaded forest, yet it produces abundant red apples every year I've seen it. So how does that work ? Don't they need to be out in the open sunshine in an Orchard somewhere receiving as much of the Sun's Energy as possible to be successful ? Evidently not! Clearly all that was necessary for these orchard trees which by the way are both originally forest trees anyway, was to be connected to the mycorrhizal networked grid. Like those tiny small little LED lights plugged anywhere into the spread out electrical miracle called Smart Fabric which looks much like a table cloth with various folds replication ridges and valleys of a Topo mapped landscape, so too any plant connected to the natural underground mycorrhizal grid will create a success story in the environment for which it's found. As long as the grid is healthy and active, any plant can be successful. Keeping the mycorrhizal grid intact or at the very least trying to repair it in the garden or urban landscape will be a plus. Both of those fruit trees clearly received not only water and soil nutrients, but also any other photosynthates manufactured by the giant trees towering above and transported through the grid to the fruit trees. These photosynthates of course are nothing more than any substance synthesized in photosynthesis, esp a sugar. The fungi benefit and so do the understory plants. Clearly the grid is important and should be respected when designing or creating any urban garden/landscpae environment or any agricultural endeavor. We however DO NOT live in that kind of world. While many good scientists and researchers have revealed a great many things found and observed in the natural world to be replicated in all of our human socirty environments, these researchers are clearly outnumbered by the numerous scientists who work for this world's giant bohemoth corporations and enterprizess. Power and obsession with wealth creation are the major drivers of a handful of individuals on this planet. Unfortunately the consequences of these old archaic failed Green Revolution Technologies have got to be put to rest and more unconventional technologies (which actual deal with the way the real world works) which think outside the corrupt scientific conventional box must be pursued. Our Earth cannot handle anymore of imperfect human meddling. In the mean time it is hoped that individuals reading here will research, study and observe for themselves first hand just how nature was originally put together and put to practice even replicate the reality found all around us in nature. I tend to walk through a forest and wonder in my mind what is causing it all the click together. I look at any ecosystem as a brilliant piece of engineering to be hijacked through my observational espionage tactics only to be later replicated in my own landscape. The ferns are beautiful, but an important part of that beaty is the mechanical workings of the underground below. I love your ferns and post. It is a shame that when they did the clear in part of our woods here that left a mess of cut trees and branches. The ferns are growing well just past the clear cut. That's right, I seem to remember your husband had a blog about that. Did he ever answer my post ? Guess I'll have to look it up. Whenever I plan a landscape layout, I think of the plants I will use as always being interconnected to one another. I walk thru some woods and it's the underground workings I'm imagining about as to why such above success in the above ground results are such a success. Using the conventional science based technology has brought our natural world to it's knees. Replicating what we observe in nature and making practical applications in the garden or urban landscape is the only way to go. Viewing nature as nothing more than a bundle of compromises has resulted in life's very survival coming now into question. The sad thing is that the motivation for doing the right thing shouldn't have dollar $ign$ attached to it. Things should be responsibly accomplished merely because it's the right way to do it. The dividends WILL payout in the long run, but in ways of continued healthy living.